As promised, each week I will be sharing with you a portion of how the Knucker Hatch household runs. Last week, I revealed our laundry management system that falls on every Monday. Tuesdays, are reserved for bathroom duty. But after cleaning SIX toilets today, the last thing I feel like doing tonight is blogging about the worst chore ever invented. I’ll save my blogging about bathroom routines for a day other than the dreaded bathroom day. So this Tuesday, I’ll give you a glimpse into how I try, (and I do stress try) to keep things organized. More specifically, how I manage keeping track of the daily outside activities and appointments for a busy family. Does anybody else out there have a mother that keeps one calendar on a wall somewhere, but honestly that is just for back-up, because she has an unbelievable Rolodex in her head? When I was growing up, my mother amazed me with her ability to rattle off everyone’s birthday. I can remember thinking, that when I grew up, I would one day get one of those Rolodex thingys in my head. Sadly, I never received the Rolodex thingy. I’m horrible with five very important and basic things in life: names, birthdays, phone numbers, anniversaries, and anything that requires RSVPing. I have a cell phone. I couldn’t tell you to save my life my cell phone number. On a really bad day, I will hesitate before I can tell you the full birthdate of one of my children. I learned a long time ago, that to keep up with the Rolodex Mom’s in this world, I would need to write it all down. In essence, I don’t think I have ever departed from the required “Assignment Notebook” all of us as teenagers carried around in junior high and high school. It is tempting to go all electronic with my information management, of which I partially do, however, I need to have a hard copy at my finger tips. Leaving notes on a wall calendar in my kitchen doesn’t help the helpless. I need it to be portable. As a result, almost every year I have used a bound monthly calendar to stay organized. This is my Rolodex ladies. This is the only reason I know what pregnancy week I am in. It allows me to write it down, and permits me then to let go and forget it. My only responsibility is to check it every day, BEFORE my day begins. So how do you survive the day to day grind? 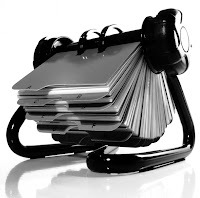 Are you a mental Rolodex Mama, or do you use another method to keep life organized? I definitely have to have a calendar. Oh everyone in this house would be in such a mess if it were all left up to my memory! I duplicate some of my organizational efforts. I have the kitchen calendar by the garage door because I often have to consult it when someone calls, etc. My other duplicated calendar is in Outlook. Having the calendar on the computer is a pain, though, for quick consultation, so it would be nice to have a daytimer type calendar. I’m going to look into the Mom Agenda. It sounds cool, although we as a family generally have the same schedule at this point in life. I guess with b’ball coming up, though, we may be going in separate directions occasionally. I really like this calendar idea. Currently, I just use a normal calendar.